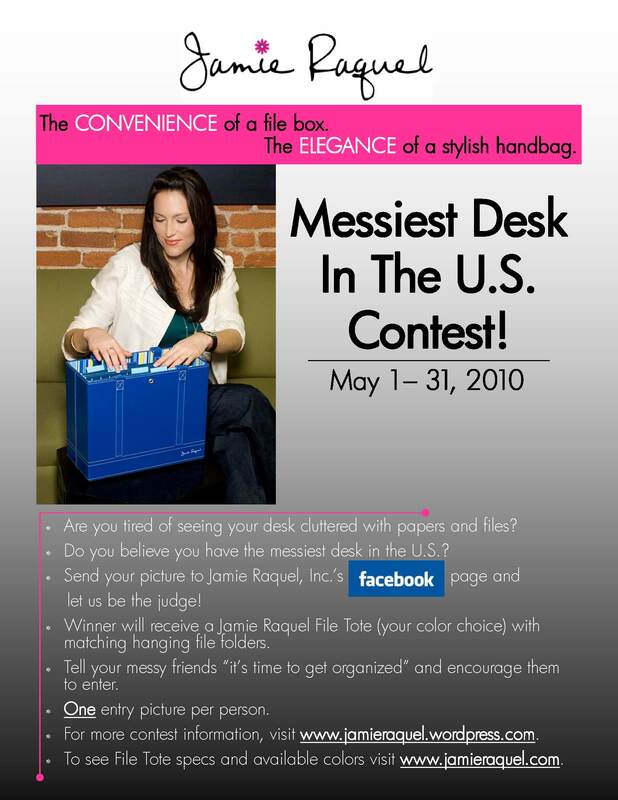 If you are tired of seeing your desk cluttered with papers and files and you are ready to GET ORGANIZED, you could be the winner of a Jamie Raquel File Tote. First, visit our Facebook page and become a fan. Then post a comment about your desk and upload a picture. It’s that simple. On June 1, we will choose a winner! If you are a lucky winner, you get to choose your tote color, with one 5-pack of matching hanging file folders. To see File Tote specs and available colors visit www.jamieraquel.com. Please send us only one picture of your desk. And don’t forget to tell your friends to enter! This entry was posted in Business Tote, Contests, Desk, File Box, Organization, Organized, Organizer Tote, Portable File Tote, Uncategorized and tagged Business, contests, File Box, Files, Organized, working moms, Working Women. Bookmark the permalink.